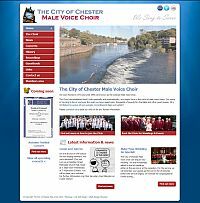 The Choir web site has had a makeover and now features the Choir's new colour scheme and logo as well as several new features including an online shop.This is the old look Homepage just to remind you of the difference. Make Your Wedding So Special! 12th October 2013 - Wedding at The Doubletree Hilton Hotel. Congratulations to the happy couple, Laura and John Little, married today at The Doubletree Hilton Hotel, Chester. It was a privilege for us to sing at your wedding. Competition win at North Wales Choral Festival. A section of the Choir is shown on stage during their winning performance last November at the North Wales Choral Festival in Llandudno.